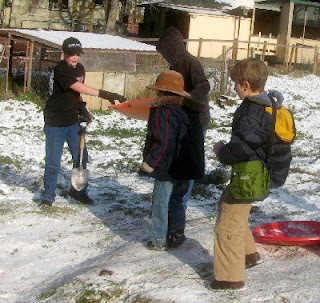 Early in the week prior to Clearwater's Winter Break and the region's monumental December 18 snow fall, a couple of inches of snow fell in southern Snohomish County. 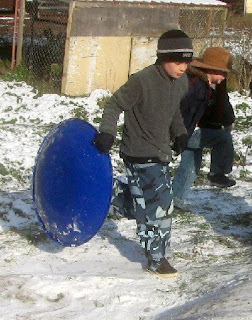 There was enough snow at school that a number of students brought snow saucers from home hoping to sled from the upper pasture to near the play yard gate. 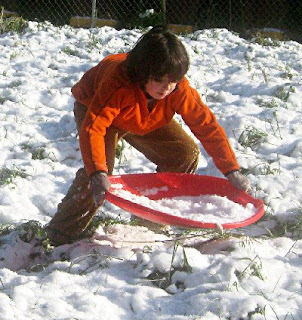 The snow was a little thin, so students decided to move snow from other parts of the field to the sledding hill. They coordinated their efforts, spending most of the day moving snow and placing it in spots that would maximize the sled run, packing it down and testing the run. This effort took much of the day and involved up to 15 students. After several hours of working and testing, they made a sled run that worked.